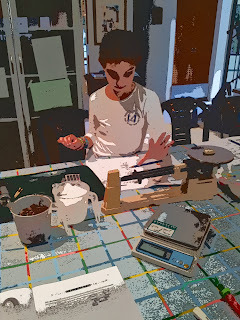 This week we added the triple-beam-balance to our repertoire of measuring tools. First we discussed the difference between volume and mass, and then we worked in pairs guessing and weighing different objects. Finally we checked ourselves and the triple beam balances using a digital scale. We noticed that a) we measured pretty consistently, and that b) our triple beam balance was only off by about a toothpick. Not that big a deal, unless of course, you're measuring toothpicks! So what do you think weighs more...a pound of gold or a pound of feathers?